Air Date: I don’t want to make the 2017 chart yet, but let’s say 02/11 & 02/18. This taping was actually mentioned on this week’s AAA TV, but I wasn’t paying close enough attention to the recap show and no one else picked up on it. Lineup was posted on an AAA Toluca page, and AAA’s officially announced it since I noted it on Twitter. 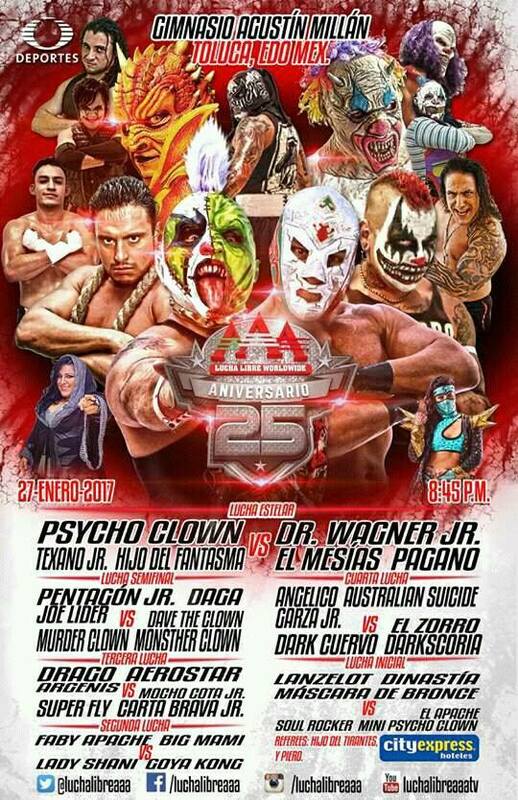 AAA traditionally runs shows in Toluca and Ecatepec early in the year. They held off Toluca until March last year, but are back on a more normal schedule. The main event is nearly a repeat of the Guerra de Titanes main event, only with Fantasma in for Parka (so it’ll be a better match.) Perhaps Texano might have a title program by this point. Dave the Clown is a semimain guy because he had a clown gimmick and is tall and it was easier to let him use him than give anyone else a clown gimmick. Or at least that’s what it comes off as. The good thing is it keeps him away from catching flyers for this show, though the Perros are going to have their work cut out for them. This is a rematch from Juarez, where the Perros won but got beat up afterwards. It probably won’t go any better for them here. The positive is there are matches which actually have a chance to be good, and that’s a change from a lot of recent AAA TV. Match 2 has no hope – I called the Goya/Mami feud – but 1/3/4 all might work out. Garza Jr. looks like the 2017 replacement for Jack Evans, after he was the 2016 replacement for Fenix. Both are asking a lot and I’m not sure he’s really delivered in AAA yet, but I can see what they’re going for. Tercera is the new Aerostar, Argenis, Drago trio against some familiar opponents. That’s probably also building up the Aerostar/Super Fly rematch, unless AAA pulls a surprise and puts Carta Brava in there or something like that. The show opening with young high flyers against good opponents. Mini Psycho Clown challenged Dinastia back in October, and AAA’s found time to include three other title matches with no particular build or reason to exist since. Maybe they’ll get around to it by June? I shouldn’t complain, this is more than what we’ve gotten for the last couple months. Back to back weekends of tapings means AAA is either changing the way they air these things (unlikely) or they’re going to have another big (three week-ish) break before the next set.